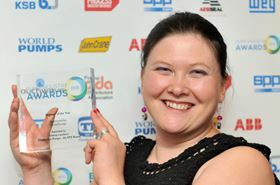 2015 Engineer of the Year Award winner Emma Lambert of ClydeUnion Pumps. The award recognises the achievements of a pump engineer who has made a positive contribution to an interesting product or project in the industry. After a successful 2016 event, World Pumps is looking forward to receiving nominations in this category for next year. Please contact World Pumps Editor Alan Burrows for further information.